Lula is sitting at the front right. 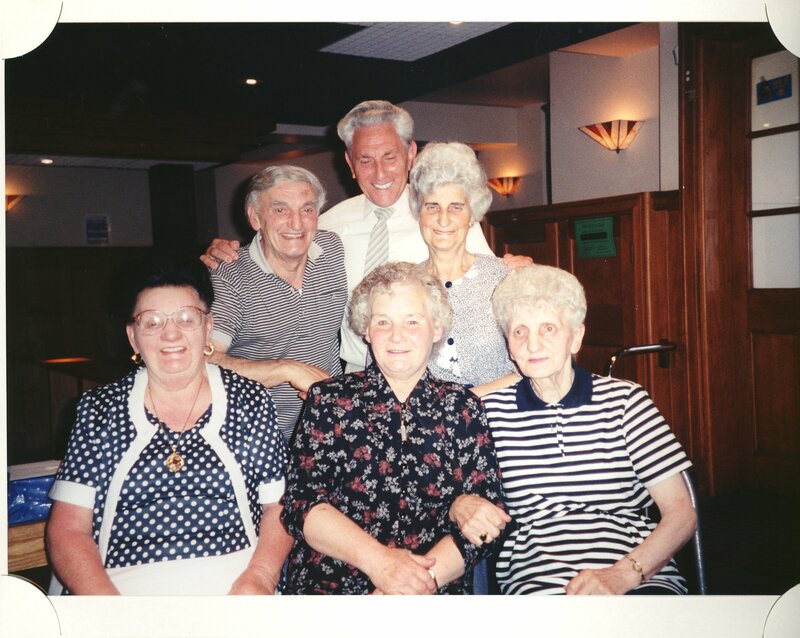 Photographed here on the event of Theresa's 80th. When she was 18 she married her childhood sweetheart Willie Ferguson and they married at St. James’ Church, McDonald Road, Edinburgh on 2nd February 1940. 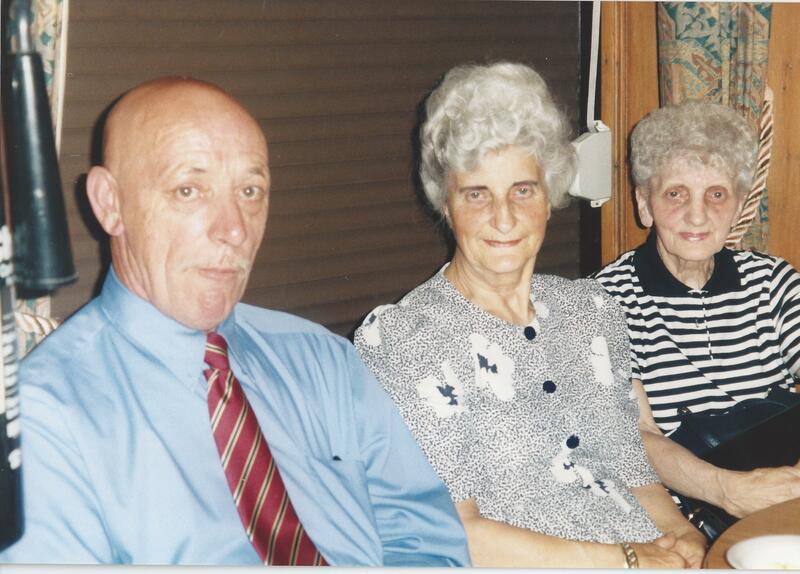 Willie’s parents were William Ferguson and his mother was Margaret Brown. Willie’s sister Elsie was a witness at their wedding. Lula and Willie have one daughter Bette Lou. Bette married John Tod. Nicola and Martin have two chidren Jonathan and Lewis. Graeme James Souness was born in Edinburgh in 1953. The youngest of three boys. He has fond memories of his childhood growing up in the Broomhouse pre-fabs and playing football on the streets of the Scottish capital. His parents, now dead, struggled to make ends meet (father James had two full-time jobs) but the family were close and the boys were loved. It is his happy upbringing which taught Souness the importance of family life. Despite his reputation as a domineering authoritarian, get him talking about his wife and kids and the so-called hardman visibly softens. With three children from his first marriage, (Chantelle, Fraser and Jordan) he married second wife Karen in 1994 and treats her son Daniel and daughter Lauren as his own. Five years ago, little James came into the world and everything changed. Despite being 46 when James was born, Souness wasn’t daunted about living with the sleepless nights and dirty nappies all over again. In fact, he relished it. “It’s definitely my second chance at fatherhood,” he smiles. “James is the greatest thing that has ever happened to me. I’ve been at the births of all my children but first time round I was playing football and maybe I was too selfish. I’d like to think I’m a better father now than I was then. He’s so great, sometimes I’ll just stare at him. I can see him looking at me thinking: `my dad’s a weirdo’ but I love him so much. James came along when Souness and his wife least expected it. Karen had fallen pregnant with her first two children very quickly so neither anticipated any problems. But after seven years together, they hadn’t been successful. Graeme Souness might have only become a dad again five years ago, but he harbours hopes of becoming a grandfather in the not too distant future. Eldest child Chantelle, 28, is in a long term relationship and Souness is looking forward to playing the role of grandad. The three children from his first marriage and two stepchildren from his marriage to Karen are scattered all over the country. Chantelle lives down in Gloucestershire and Souness’s 23-year-old son Fraser is based in Edinburgh. Jordan, 19, is at college in Farnborough. Karen’s son Daniel, 20, is a student based in Manchester and 18-year-old daughter Lauren is on a gap year in London. Scottish football star Graeme Souness met his match when he paired up with millionaire’s daughter Danielle Wilson, who wasn’t interested in his fame and fortune, like many other girls he met. The couple met when a friend dragged 20-year-old Danielle along to a football match. Although she was already divorced with an 18-month-old daughter, the pair got engaged after six months and were married two years later in 1984. Souness also adopted Danielle’s child as his own. She wore a straight, high-neck white dress, with dainty flowers in her long blonde hair. He wore a white double-breasted suit with rose corsage. At the time of their wedding, Souness was captain of Liverpool FC, earning £80,000 a year, but after his marriage he moved to Sampdoria in Italy on a two-year contract, earning £650,000. By this time the pair had three children – Chantelle, Fraser, and Jordan. Danielle walked out on their marriage eight years later after issuing an ultimatum: your family or football. Souness, now 55, had a heart attack in 1992 and remarried in 1994. He has a son, James, with his second wife Karen. 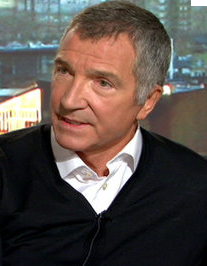 Graeme James Souness ( /ˈsuːnɨs/; born 6 May 1953) is a Scottish former professional football player and manager. Souness was the captain of the successful Liverpool team of the early 1980s and player-manager of Rangers in the late 1980s as well as captain of the Scottish national team. He also played for Tottenham Hotspur, Middlesbrough and Sampdoria in a long career. Following his retirement from playing he worked as a manager, with Rangers, Liverpool, Southampton, Benfica, Galatasaray, Blackburn Rovers and Newcastle United. Souness now does media work and divides his time working as a pundit for RTÉ, ESPN, Sky Sports and Al Jazeera Sports.